Elitism. That word has gotten tossed around recently following the Lake Minnetonka Association’s recommendation that inspection fees be charged to help pay for inspections and other aquatic invasive species programs. I have offered our rationale and justification for this recommendation as well as described a comprehensive protection plan in previous columns. Unfortunately, an accusation of elitism is usually meant to stop dialog and is seldom constructive. Lake Minnetonka has its share of wealth among its lakeshore residents, but probably not more than many other Minnesota lakes. As well, there is a very large portion of middle-income residents on the lake. Lakeshore owners on Lake Minnetonka – individually and collectively - are good stewards of the lake and are motivated buy a sincere desire to protect this beautiful lake. Lakeshore owners and members of the Lake Minnetonka Association care about Lake Minnetonka. I have worked with hundreds of lake associations in Minnesota and other states and my experience is this trait – a high level of stewardship and affinity for the lakes people live on – is common to all lakeshore owners. Lakeshore owners’ investment in their lakeshore properties is much more than financial. Their investment is emotional, environmental and spiritual. That is why they want to take care of their lake and they expect visitors and public agencies to share in that stewardship responsibility. I sometimes hear criticism that if lakeshore owners on Lake Minnetonka really cared, they would not have rip rapped lakeshore, manicured turf lawns or weed removal in their beaches. We need to consider these charges in the context of Lake Minnetonka being a large, popular, urban lake – indeed the most highly used recreational lake in Minnesota. Nearshore waves cause damage to unprotected lakeshore and some kind of stabilization is needed to protect the shore. Rip rapping and other structural methods are one way to protect the shore and these are permitted by regulatory agencies. 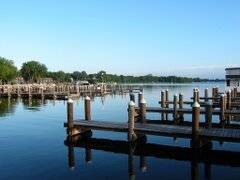 The Lake Minnetonka Association encourages the use of lakescaping, a more natural method, but on a voluntary basis and where it is feasible. We see this trend beginning to become more popular. Similarly, turf lawns are the norm for urban areas. Lakeshore turf areas are no different that residential lawns away from the lake - both drain to the lake. Also, Minnesota has restricted the use of phosphorus in lawn fertilizers, so the concern with phosphorus in runoff from fertilized lawns is greatly reduced. Weed control in areas adjacent to lakeshore properties is a common practice – as in hundreds of other Minnesota lakes. This activity, again permitted by regulatory agencies, represents a small overall impact, especially compared to the impact of the milfoil infestation. The Lake Minnetonka Association supports moving to a new model where invasive plants are controlled and native plants are protected. This is the approach being used in the Three Bay milfoil control project and one we hope will be adopted lake-wide. Lake Minnetonka lakeshore owners do all of this because they love and care about the lake. It is frustrating and disheartening when they do not see the same level of care, commitment or investment from lake visitors and public agencies. We all have a responsibility to be good stewards of Lake Minnetonka. Lakeshore owners as well as visitors and public agencies can all certainly make improvements in our stewardship of the lake. So, in a sense, Lake Minnetonka lakeshore owners are elitists - elite stewards of the lake.